Friday afternoon, Syracuse once again fell behind in the first half, this time by as many as eight points, but once again rallied for a win, this time beating #25 Texas A&M, 74-67, to take home the Battle 4 Atlantis title. Tournament MVP Michael Gbinije hit a three-pointer with just over six minutes remaining in the game to push the Orange (6-0) in front for good, then the Orange ran off eight straight points to finish off to the Aggies (6-1). Gbinije was honored for a three-game performance that saw him average 21 points, 5.0 assists, and 2.7 steals per game while shooting 58.8 percent (20-of-34) from the field, including 60 percent (12-of-20) from three-point range. 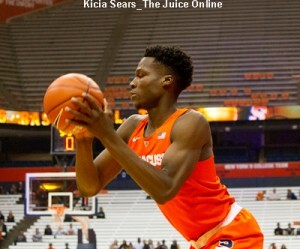 A day after poor foul shooting nearly cost them a game, SU made 19-of-24 free throws. The Aggies, in contrast, went to the line only 11 times, making seven. After Michael Gbinije opened the scoring with a trey, Texas A&M struck back for the next seven points of the game. 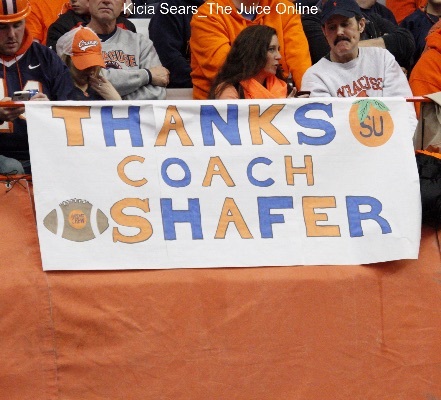 Syracuse responded with a run of their own. Tyler Roberson got the burst started by kicking a pass out to Trevor Cooney for a three-pointer late in the shot clock. Roberson then cleaned up a pair of misses with a stickback and added a jumper from the foul line. Moments after subbing into the game, Tyler Lydon turned his first touch into a three-pointer from the left wing, capping the 10-0 run and giving the Orange a 13-7 lead. The Aggies turned things around by outscoring SU, 12-5, in less than five minutes. A&M’s strong play boosted them to a 19-18 lead with under nine minutes left in the half. Syracuse jumped back in the lead thanks to a swished three from Trevor Cooney. Cooney then set up Lydon on the left baseline for a mid-range jumper that put the Orange on top, 23-19. Texas A&M responded with another run, this time piling up nine straight points. The streak pushed the Aggies in front by five points with just under four minutes on the clock. 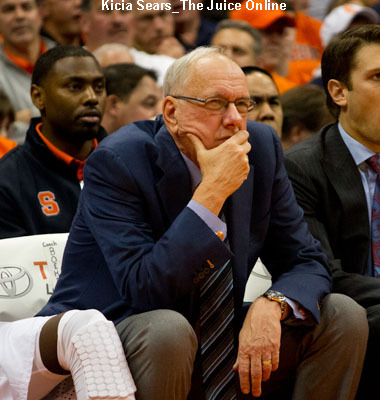 SU shook off a five-minute scoreless streak when Cooney dropped in a fast break lay-up. A&M responded with a basket and a triple to push their lead to 33-25 with less than two minutes until halftime. Malachi Richardson drained a three from the right wing to clip the margin to five, but Texas A&M tacked on another basket. Gbinije took over in the waning seconds of the half, hitting a deep straightaway three, then stealing the inbounds pass and getting fouled while trying a halfcourt heave to beat the buzzer. Given three fouls shots, Gbinije made the first two, bringing Syracuse within 35-33 at halftime. Gbinije kept up his strong play in the opening seconds of the second half, hitting Richardson in the left corner for a three that nudged the Orange out to a one-point lead. A couple minutes later, with SU down two, Richardson played the passing lane perfectly, getting a steal and taking off to the basket. Richardson took a hard foul, which was ruled flagrant, and made both shots. The freshman forward continued to play aggressively, drawing another foul a minute later and adding two more charity shots for a 40-38 Syracuse lead. After the first media break of the half, Texas A&M had three consecutive successful possessions to take a 44-40 lead. Richardson again replied, this time with a driving three-point-play. After another Aggie basket, Gbinije connected from the left wing for three, again tying the score, this time at 46 a side. Over the next six minutes, the teams both traded blows, but neither team was able to gain more than a three-point advantage. With just over six minutes on the clock, Gbinije hit his fourth three-point basket of the day to give SU a 64-61 lead. Texas A&M chipped away at the lead with a lay-up, but the Orange ran off eight consecutive points to put the game in the cooler. Lydon opened the stretch with a leaning three-point try off a shot fake. The attempt got a favorable bounce and dropped through the net. Cooney connected on a pair from the line, then made a steal at the top of the 2-3 zone. The fifth-year senior finished the possession he started by dropping in a floater while being fouled. The free throw gave the Orange a 72-63 lead with 3:10 left in the contest. The Aggies got a pair from the line on their next possession, but neither team could connect after that until Gbinije drained two foul shots with 42.2 seconds on the clock to reinstate the nine-point Syracuse lead. Texas A&M added a meaningless lay-in at the final horn and the Battle 4 Atlantis title went to the Orange. Michael Gbinije topped four Syracuse players in double figures with 20 points, including connecting on four three-point shots. Malachi Richardson scored 16 points, including 13 after halftime. Trevor Cooney, who was named to the All-Tournament Team, added three steals to his 15 points. Tyler Lydon came off the bench to contribute 13 points and eight rebounds. Jalen Jones paced all scorers with 23 points in a reserve role for Texas A&M, tallying 16 in the first half. Danuel House was the only other Aggie to reach double digits in scoring, finishing with 15 points. Tyler Davis and Admon Gilder each chipped in with eight points. The Orange return home for their matchup in the ACC-Big Ten Challenge on Wednesday when Wisconsin comes to the Carrier Dome. The Badgers, who started the season ranked #17 in the nation, stand 4-2 on the season with victories over Notre Dame and VCU, but a loss to Georgetown also on their resume. They also will take on #7 Oklahoma in a road clash on Sunday prior to traveling to Syracuse. Tip-off is set for 7:15pm Eastern and the game will be televised by ESPN2. The game will also be available online at ESPN3.com.